In addition to the fake punt and the Darren Sproles non-fumble (recapped here), Sunday’s game against the Saints featured a lot of unusual activity on special teams. Three holding penalties were called on place-kicks, two on extra points and a huge one on the Saints’ final field goal try. Special Teams Coordinator Shawn Slocum said he had never seen that before. The Packers had one of those holds, plus two other penalties on an earlier field goal – too many men on the field and a personal foul on B.J. 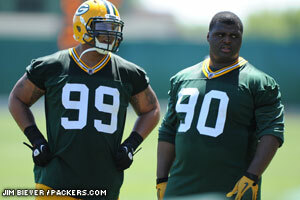 Raji. Slocum said the 12-men penalty was due to a lack of communication when the Saints first appeared they might go for it and then sent out their kicker late. The personal foul on Raji, who threw a punch at a Saints blocker he thought was going for his knees, gave the Saints a fresh set of downs but could have been worse.